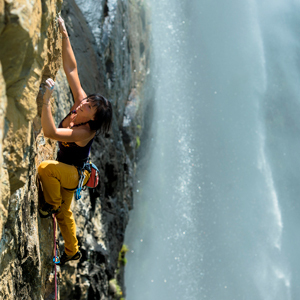 my name is Barbara Raudner and I am a fanatic climber! I live in Lower Austria (near Vienna) with my husband Hannes Raudner-Hiebler and I started climbing at the age of 28 during a mountainbike trip to Arco (Italy) and I fell in love with climbing from the first moment on. For me climbing allows me to push my limits, physical and mental. After my studies of „French/Economics and Law“ at the Karl Franzens Universität Graz (Styria) as well as of „Communication and Advertising“ at the Werbeakadamie Wien (Vienna), I was working for the European Commission in Austria as a Public Relations expert for more than 18 years. This was a very interesting work, but in 2012 I took the big decision to leave this job and to start doing something totally new. Life is short, so you should live it now. I am very lucky to have visited many wonderful places and to have met many beautiful people whilst living my life of adventure these past few years together with Hannes. Focussing on my own dreams and setting my own personal challenges has given me the direction for which to pursue my climbing. I love being outdoors!! Besides my own climbing, I work for E9 in Spain and for Metolius in Italy, and I am supported by some of the most important international climbing brands like E9, Metolius, Sterling and La Sportiva. and a lot of 8bs in Austria, Slovenia, Italy, Spain, France and Switzerland over the past 10 years.